Probably few visitors at Washington have not had pointed out to them from the north door of the Senate wing of the Capitol the site of the old "Washington property." The house named in the General's will stood near the old Capitol until both were burned, in August, 1814, by the English Vandal, Cockburn. Close on this well-remembered site stood, in 1833, an unpretending wooden building but sixteen feet square, erected at the expense of a lieutenant of the navy, and equipped with a five-foot Troughton transit instrument. This was our Naval Observa­tory in embryo. The transit was one of the instruments made for the Coast Survey, under the super­vision of Mr. Hassler, its first superintend­ent, during his long detention in England; for it may be remembered that the begin­nings of our Coast Survey work also were slow enough. Under the act of 1807 Mr. Hassler was appointed superintendent, but this was not till the year 1811; and on his visit to London to secure his instruments, then so slowly constructed, he was caught there by the breaking out of the war. Re­turning only in 1815, and the survey itself being soon arrested by Congress, his instru­ments and the " fixed observatory," the es­tablishment of which he was the very first in this country to propose, rested quietly in status quo ante bellum. 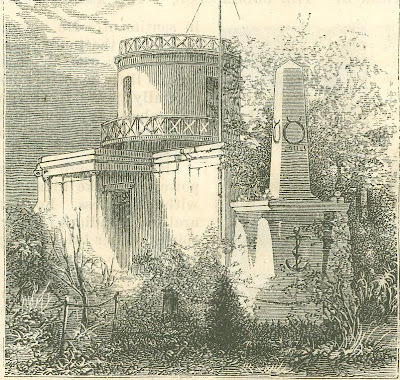 In 1832 the Coast Sur­vey was revived; but as an observatory was peremptorily forbidden by the law, the trans­it was loaned to Lieutenant Wilkes for his observations; and Mr. Hassler from this date, instead of further urging the creation of an observatory under the Coast Survey, or of exhibiting any jealousy of the new institu­tion when afterward secured, accepted its legitimate separate existence and objects, and always gave them his cordial support. Lieutenant Wilkes's observations were, however, at first only for obtaining clock errors, needed for determining the true time for rating the naval chronometers then un­der his charge. This testing of all the chro­nometers and other naval instruments used by our ships (begun in 1830 by Lieutenant Goldsborough) had been at once found a wise and useful economy for the navy. The secretary, therefore, established this little receptacle for charts and instruments by placing an officer in charge, permitting him to build his own little observatory and do his own work. The "Depot" was the chris­tening then given to the establishment. This was all that Wilkes or any one of his successors dared call it even as late as 1842, when establishing the veritable present as­tronomical institution. 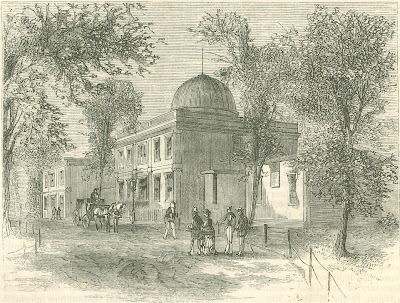 Hassler had pro­posed an observatory, and Gallatin and Jef­ferson had indorsed his plan; Monroe, when Secretary of State, had recommended it in a report to the House of Representatives; President Adams had urged it in 1825, in 1838, and in 1842; but for partisan reasons it was again and again peremptorily forbid­den, and remains so to this day to the Coast Survey. But in 1838 a new call was made upon the Depot, which turned the whole current of its future. The exploring expedition was about to sail for the South Seas. It would be of prime importance, in determining the longitude of places to be visited by the ex­pedition, that corresponding astronomical observations should be made at home, to be compared on its return. Secretary Paul­ding gave the observations in the United States to Lieutenant Gilliss, Wilkes's suc­cessor at the Depot, and to Professor Bond, of Cambridge. For the years 1838-42 Gilliss worked most accurately and unremittingly. With the help of an achromatic telescope, added by the Navy Department, and the transit before mentioned, he observed and recorded 10,000 transits; and his observa­tions, afterward tested by Professor Peirce, were ranked by him among the highest then made. They are in the libraries of the astronomers of Europe. They procured„ in fact, the founding of the present Naval Observatory. For this, however, hard work in abundance was to be done. 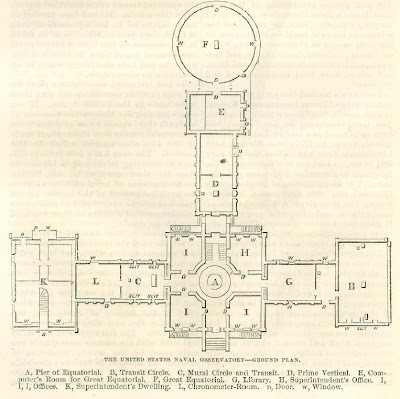 Gilliss urged the unsuitableness of his building erected alongside of Wilkes's wooden square room, and his want of space to erect a permanent circle. He won over the old Navy Commissioners and the endorsement of the secretary to their recommendation for something better. He pressed the Naval Committees frequently and closely, but enlisted scarcely one except Mallory, of the House. Almost to a man they kept away from the Depot, although it was "so near," and no help seemed avail­able. But a celestial visitant now appeared, as, singularly enough another did in 1843 for the benefit of the Cambridge Observa­tory. 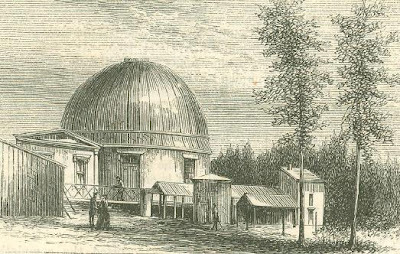 It gained the day for Gilliss, and for an observatory at Washington. He had closely observed Eucke's comet, and read a paper on it before the National Institute. When he made, shortly after this, his last intended visit to the Senate committee, Preston of South Carolina asked, as are you the one who gave us notice of the comet? I will do all I can to help you." In a week a bill passed the Senate; and, strangely enough, passed the House also, without dis­cussion, on the last day of its session. It appropriated $25,000; but still "for a Depot of Charts and Instruments." But the Secretary of the Navy was no longer officially bound by the name. The report of the committee, which secured the bill, was so expressly in favor of astronom­ical, meteorological, and magnetic objects, that Congress was justly understood to sanction them. Gilliss was sent abroad for in­struments and plans for an observatory. The site chosen by President Tyler for the building was fraught with historic interest. It embraces the whole of "Reservation No. 4," made, by the old commissioners for lay­ing out the city of Washington, for a na­tional university—a favorite idea of General Washington. It was the landing-place of Braddock, April 11, 1755. At a later day it was known as Camp Hill, from its being oc­cupied by the American forces the day before their unfortunate advance and retreat from Bladensburg. The square embraces a little more than nineteen acres in measurement. It is now tastefully laid out and ornament­ed. It is on the second highest emi­nence within the city limits, commanding the view of the public buildings, of the neighboring cities of Georgetown and Alex­andria, and of Arlington. 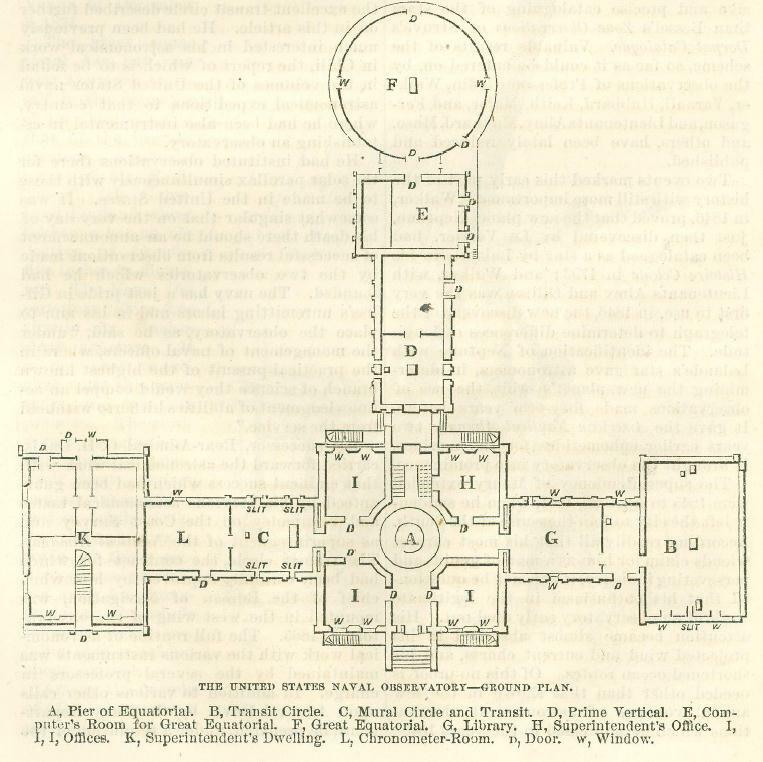 In 1844 Gilliss reported the, completion and equipment of the central building shown in our plate. He had secured the excellent equatorial, the meridian circle, the transit, prime vertical and mural circle on which so much valued work has been done. He had begun a library, to which nearly two hundred volumes of the highest standard works were donated by the Greenwich, Paris, Berlin, and Vienna institutions. Lieutenant M. F. Maury was placed in charge, and entered on his duties with zeal­ous purposes. He proposed in 1846 the im­mense astronomical work of a more exten­sive and precise cataloguing of the stars than Bessel's Zone Observations or Struve's Dorpat Catalogue. Valuable results of the scheme, so far as it could be entered on, by the observations of Professors Coffin, Walk­er, Yarnall, Hubbard, Keith, Major, and Ferguson, and Lieutenants Almy, Maynard, Muse, and others, have been lately reduced and published. Two events marked this early part of the history with still more importance. Walker, in 1846, proved that the new planet Neptune, just then discovered by Le Verrier, had been catalogued as a star by Lalande in his Histoire Celeste in 1793; and Walker, with Lieutenants Almy and Gilliss, was the very first to use, in 1846, the new discovery of the telegraph to determine differences of longi­tude. The identification of Neptune with Lalande's star gave astronomers, in deter­mining the new planet's orbit, the use of observations made fifty-two years before. It gave the American Nautical Almanac two years earlier ephemerides for the mariner. It brought the observatory into prominence. The superintendency of Maury extended from 1845 to April 26, 1861, when he sudden­ly left the city to join the cause of the South. According readily all that his most earnest friends claim for him as a man of genius and persevering industry, it cannot be questioned that his enthusiasm in the legitimate work of an observatory early died out. His attention became almost absorbed in his projected wind and current charts, and his shortened ocean routes. Of this no proof is needed other than that shown in the few annual volumes of astronomical observa­tions which he published in the years 1846—50, and in the failure to issue any others for the elev­en following years. His labors in connection with ocean routes are now daily more and more appreciated. In 1861 Lieuten­ant J. M. Gilliss was at length placed in charge. He re-es­tablished and vigor­ously pressed for­ward astronomical work as well as the duties of the "Hydrographical Of­fice," a title which had been added to that of the Naval Observatory. 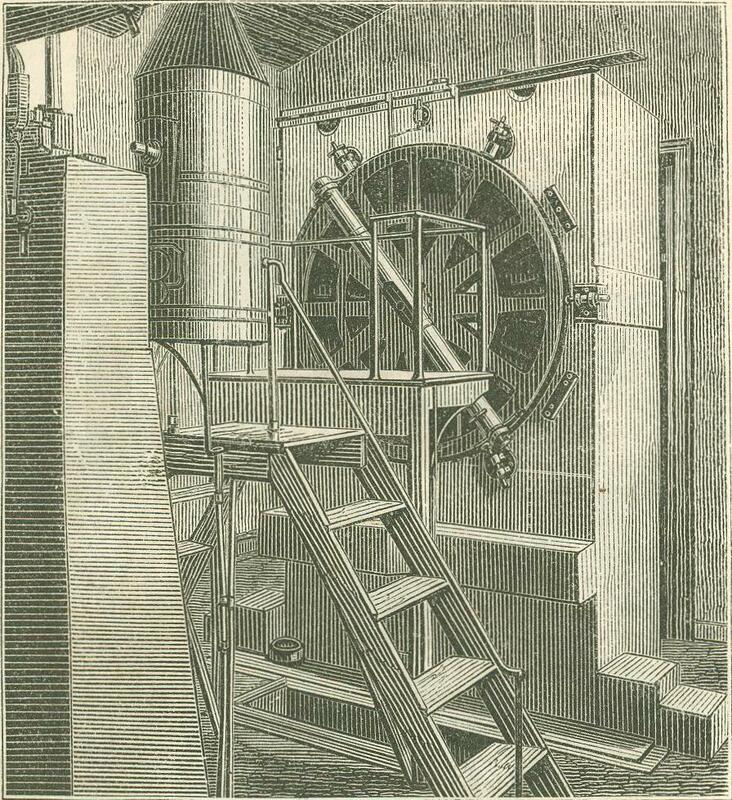 At the time of his very sudden death, after a brief superintendency of less than four years, he was earnestly engaged in bringing forward the legitimate work of the observatory, in connection with which he had contracted for the excellent transit circle described further on in this article. He had been previously much interested in his astronomical work in Chili, the report of which is to be found in the volumes of the United States naval astronomical expedition to that country, where he had been also instrumental in es­tablishing an observatory. He had instituted observations there for the solar parallax simultaneously with those to be made in the United States. It was somewhat singular that on the very day of his death there should be an announcement of successful results from observations made by the two observatories which he had founded. The navy has a just pride in Gil­liss's unremitting labors and in his aim to place the observatory, as he said, "under the management of naval officers, where in the practical pursuit of the highest known branch of science they would compel 'an ac­knowledgment of abilities hitherto withheld from the service." His successor, Rear-Admiral C. H. Davis, carried forward the astronomical work with that eminent success which had been guar­anteed by his previous astronomical tastes and occupancy on the Coast Survey and as superintendent of the Nautical Almanac. The transit circle, the contract for which had been cordially approved by him when chief of the Bureau of Navigation, was mounted in the west wing of the observa­tory in 1865. The full routine of astronom­ical work with the various instruments was maintained by the several professors in charge. In addition to various other calls upon Admiral Davis by the Navy Depart­ment, he prepared, under a resolution of the Senate, a report on the subject of an inter-oceanic ship-canal, 8000 copies of which with its accompanying maps were distributed by Congress and by the observatory. Within two brief years he took command of the South Atlantic squadron. Rear-Admiral B. F, Sands, succeeding him in the year 1867, has most efficiently improved the opportunities of a longer super­intendency to inaugurate and carry forward some of the most important astronomical operations of the day. To these we can only refer. The phenomena of the total eclipses of 1869 in the United States and of 1870 in the Mediterranean countries were closely ob­served. Their fully illustrated reports were published by Congress in large editions, now exhausted. Beyond the regular and severely exacting astronomical routine of observations, two centers of interest have been recently occu­pying the utmost activities of the institu­tion: the reception, mounting, and use of the new great equatorial, and preparations for going out to observe the transit of Venus of December 8, 1874. 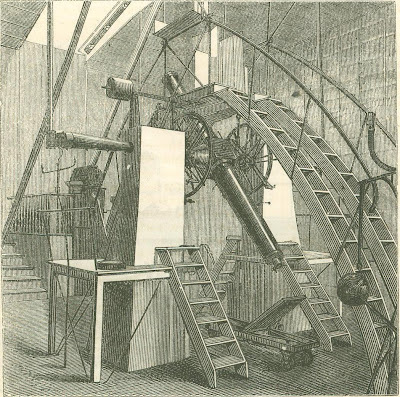 The great equa­torial has but one near approach to it­self in the diameter of its object-glass that of the private amateur establish­ment of Mr. R. S. Newall, at Gates­head, England, whose telescope has an ob­jective of twenty-five inches in diame­ter. The Naval Observatory glass has twenty-six inches clear aperture. It is not easy to re­alize what this pow­er is, and what it promises. The read­er must imagine him­self within a dome, itself forty-one feet in diameter and forty feet in height, look­ing through a tube made of three sec­tions of steel stretch­ing away for thirty-two feet; the whole telescope and its me­tallic base weighing about six tons. Among the friends of the observatory who aided in secur­ing the appropriation in Congress for this instrument was the present Judge and late Senator C. D. Drake, once himself in the United States navy. Through his urgency before the conference committee the appro­priation was secured of $50,000 for the tele­scope, and $14,000 for its tower and dome. 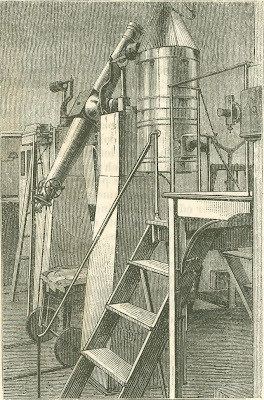 Chance and Co., of Birmingham, England, cast the big lump for the object-glass; Al­van Clark, of Cambridgeport, with his sons, ground and polished it; and in the month of November, 1873, successfully mounted it. The planning of the dome and tower and the general conception of the instrument, in­cluding the application of water-power in place of the usual driving clock-work, and of illumination by electric light, are to be credited to Professor Newcomb, in charge. The transit of Venus, occurring but once at most in a lifetime, and offering a valu­able method of determining the sun's par­allax—the base line of measurement of ce­lestial distances—is the astronomer's great event of this century. Preparations to ob­serve the transit of December 8, 1874, have been going on for some time past at the ob­servatory. Congress, as our readers may be aware, in 1871, appointed a commission to have charge of America's responsibility in the work. The superintendent of the observatory, Admiral Sands, Professor Peirce as head of the Coast Survey, and Professor Henry as President of the National Academy of Sci­ences, with two professors of the observato­ry, Newcomb and Harkness, form the com­mission. One hundred and fifty thousand dollars have been appropriated. If we have now made the reader acquaint­ed with the progress of the observatory, and, incidentally, with a part of its work, will he follow us through the building, and inspect the instruments and officers' work in the different apartments not yet described? If he has registered his name in the front hall, and will ascend to the dome of the central building, he will find himself winding around a circular wooden casement, which covers the pier of mason-work on which the equa­torial purchased in 1845 rests. The founda­tion of this pier is laid in hydraulic cement. Its diameter at the base is fifteen feet, and it is solid to a height of ten and a half feet, where the diameter is twelve feet. On this is a conical pier of bard-burned brick, of which the diameter at the base is twelve feet, and the height twenty-eight feet; the di­ameter at the top is seven feet, and the walls three feet thick to within ten feet of the top, gradually increasing in thickness, the last three feet being solid. The pier is capped by New York flagging stone, on which rests the pedestal, which is one block weighing seven and a half tons. On this stands the fine equatorial made by Merz and Mahler, Munich, at a cost of $6000, its ob­ject-glass being valued at more than half that sum. The work of this instru­ment under, successively, Professors Ferguson, Walk­er, Hubbard, and Hall, has been chiefly upon the small­er planets, the asteroids, and comets. Mr. James Ferguson was the first of Americans to discover an asteroid, naming Euphro­syne in 1854, the thirty-first on a list which has been recently enlarged beyond even a hundred by Peters of Clinton and Watson of Ann Arbor. The object-glass of the equatorial has an aperture of 9.62 inches and a focal length of 14 feet 4.5 inches. Its powers of positive eye-pieces for use with its filar micrometer vary from 90 to 899. If the visitor pass out from this revolving dome of twenty-three feet diameter to the platform and balustrade around it, he may enjoy a fine view of the city and the Poto­mac; and if he is visiting precisely at 12 M. he will see the ball drop from the flag-staff, giving the time to the city and the shipping on the river. The ball itself is a frame-work of oak ribs of two and a half feet in diame­ter. It is hoisted by halyards to the top of the flag-staff, the metal eye at the end of the rope passing over a steel spring, which is governed by a magnet. At the instant of noon the pressure on the key by the naval of­ficer in the chronometer-room below breaks the electric circuit, the magnet above re­leases the metallic eye by the flying back of the spring, and the ball drops. old as the year 1482, others representing the full work of the European observatories and learned societies to the present date. From the library we pass into the transit-circle room, built in 1869, to admire the beautiful instrument, with its collimators and its chronograph. The focal length of the object-glass is 12 feet 1 inch; its’ clear aperture 8.52 inches; and the power of its eye- pieces 135 to 396. The diameter of its circles at the outer edge is 45.30 inches, and at the graduation 43.40 inches, both circles being divided to every two minutes. The power of the reading microscopes is 45.3 diameters. Its collimators have a focal length of 2 feet 11 inches. This instrument, under Professors Newcomb, Harkness, and Eastman, and their assistants, has had for its chief work the more accurate determination of the stars whose places are computed in the Nautical Almanac, and of those needed by the Coast Survey. The chronograph, made by Alvan Clark, is of the form known as the Hipp chronograph, with modifications by Profess­or Harkness. If the visitor now pass to the eastern wing of the observatory, he will find, side by side, the mural circle and the smaller transit in­strument, with their clock and chronograph. The mural circle has an object-glass of 4.10 inches, and a focal length of 5 feet 3.8 inches, the highest power of the eye­pieces being 240. The diameter of the circle at its outer edge, where the graduation is placed, is 60.35 inches. It is divided to every five minutes; the power of its read­ing microscope is 17.1 diameters. The transit has a focal length of 7 feet 0.4 inches and its ob­ject-glass an aper­ture of 5.33 inches. The open door of our plate on page 538 leads us into the chronometer-room. This shows anoth­er and a distinct but important office of the observatory. The relation of all its work to the in­terests of practical navigation is sufficiently clear. The whole series of astronomical observations made by the different instruments is designed, like those of the Greenwich Observatory, as ex­pressed in the royal warrant of the astrono­mer, “to rectify the tables of the motions of the heavens and the places of the fixed stars, in order to find out the so-much desired lon­gitude at sea, and perfect the art of naviga­tion." But the direct appliance of the navi­gator at sea to determine his longitude, in addition to the use of these and of his own observations of the heavens, is found in his faithful chronometer at his side. The room is usually well filled with these, which are daily wound and compared with a standard clock. A close record is kept of their rates. The rule of their trial is, to apply twice the difference between the greatest and the least rates during a period of at least six months; rejecting those whose variation exceeds eight seconds. On the purchase of new instruments, or on the return of the United States vessels from their cruises, chronometers are usually sent to the observatory for inspection and rating. 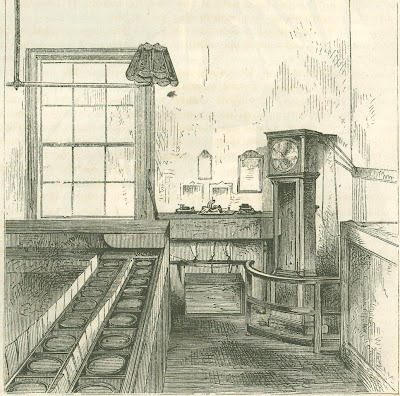 On the vessel's going again into commission, chronometers are furnished from this room, being packed with great care, with their self-registering thermometers, and dis­patched by the hands of a trusty officer to the navigating officer of the sea-going vessel. More than 200 time-keepers have been at one time under care in this room. As many as eighty in 1867 were condemned and withdrawn from use. It is as gratifying as it is creditable to American skill to find that the chronometers of Messrs. Negus and Co., of New York, equal, if they do not excel, any of foreign workmanship. From this room of the observatory the exact time is furnished daily at 12 M. to the Western Union Telegraph office in Washington for dispatch throughout the United States. The naval officer, stand­ing by the standard mean clock, and hav­ing the astronomical correction of that clock also before him, at three minutes be­fore 12 M. calls the telegraph operator at his office, and, at the instant of true noon, taps the electric key, giving the time to the company's office. He also drops the dome ball, as before named. The chro­nometer-room is under the very efficient direction of Commander A. W. Johnson, U.S.N. We have now taken our visitor through the building so much enlarged since its first erection in 1844, and have had a look at the larger astronomical instruments, omitting some, and excluding from our limited columns notice of the daily mete­orological records kept from the time of the establishment of the institution, as well as of the separate reports of cyclones, meteoric showers, etc., made in different years by the professor in charge of this branch, J. R. Eastman, U.S.N. The seven­teen annual volumes of astronomical and meteorological observations now published best set forth in themselves the work of the observatory. The latest of these volumes vie in extent and in value with the publica­tions of Greenwich and Paris. The star catalogue, issued as Appendix No. 1 to the volume for 1871, embraces more than 100,000 observa­tions, giving the places of 10,000 stars. It is the twenty years' work of Professor M. Yar­nall, embracing the reduction of his own observations and those of others from the year 1845 to 1871. The as­tronomer knows how to appreciate such a work. The visitor who comes to gratify even an amateur taste can hardly fail to be interested in his inspection of the observatory. And better still for sci­ence, the Congress of the nation, in, whose hands is the destiny of the institution, has promptly appre­ciated its claims, and does not withhold the liberal though economical appro­priations asked for it as due to astronomy and to this branch of naval efficiency. Happily what Mr. Seward affirmed in his life of Adams is no longer true of our government, that "while so large a portion of its resources have been wasted in promoting party measures, little or nothing is de­voted to the encouragement of the arts and sciences which exalt and refine a people." This was erected in 1839 for astronomical purposes and the accommodation of the library of the academy and its philosophical ap­paratus. The institution of an observatory is to be cred­ited to Professor W. H. C. Bartlett, LL D, so well-known for more than thirty years as its di­rector. 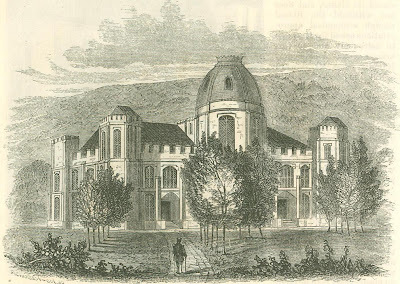 In 1840, Professor Bartlett visited Europe for the government, inspected and reported upon its chief observatories, sub­mitting also a plan for an observatory at Washington, and purchasing for West Point while abroad its’ three large instruments, the equatorial, the transit, and the mural circle. The transit instrument in the east tower was made by Ertel and Son, and its object­ glass by Merz and Mahler, at Munich, the whole cost being about $1130. It was mount­ed in 1843, the memorable year for observa­tories in the United States. Its object-glass has a clear aperture of 4.62 inches, and a focal length of 76.75 inches. It is provided with four eye-pieces and one dark glass, and has an illuminating apparatus, giving either a bright field with dark lines, or a dark field with bright lines, which can be modified at will by means of a colored wedge. The reti­cule has seven vertical and two horizontal lines. An extra vertical wire is driven in a horizontal direction by means .of a microme­ter screw, each division of which corresponds to 0.334". It has a striding level, each small division being 1.23"=0.082s. The steel piv­ots have not sensibly changed their equal­ity of dimensions since the instrument was mounted. The west tower has the mural circle, by Troughton and Simms, of London. This was cast in one entire piece of brass. Its diameter is five feet, and its graduations are on two bands, one of gold, the other of pal­ladium. The telescope has a clear aperture of four inches, with a focal length of sixty inches. The central main tower has a revolving dome of twenty-seven feet in diameter, which rests on six 24-pound cannon-balls, turning between cast iron annular grooves. The equatorial, made by Mr. Henry Fitz, of New York, has a focal length of fourteen feet, and a clear aperture of nine and three-quarter inches. It has thirteen eye-pieces. The hour circle reads to two seconds of time, and the declination circle to twenty seconds of an arc, each circle being twenty inches in diameter. This instrument cost $5000. The sidereal clock, by Hardy, has a Bond break-circuit attachment, and is connected with the several instruments by wires and break-circuit keys. Besides these there are valuable portable instruments in the observ­atory, which loans them from time to time to topographical and surveying parties in our West and Northwest, or to stations of the Engineer Corps, like the one at Willett's Point, New York. Several valuable addi­tions, including a Bond chronograph, the­odolites, and sextants, have been made with­in the last two years. The purposes of the observatory of the academy are most effectively secured by confining its workings to the end of edu­cating the cadets in the knowledge and practical use of the instruments. During the spring months they are taken in parties of two, three, or four to receive such instruc­tion, and are required themselves to make observations with each instrument, and re­duce them. During the summer encamp­ment a month is devoted to further instruc­tion in connection with a field observatory at Fort Clinton, where they use a field trans­it, zenith telescope, and other instruments. Each makes his own records, and works out his results for the ordinary problems of time, latitude, longitude. Wurdeman of Wash­ington is constructing for this field observa­tory a new transit and zenith telescope. 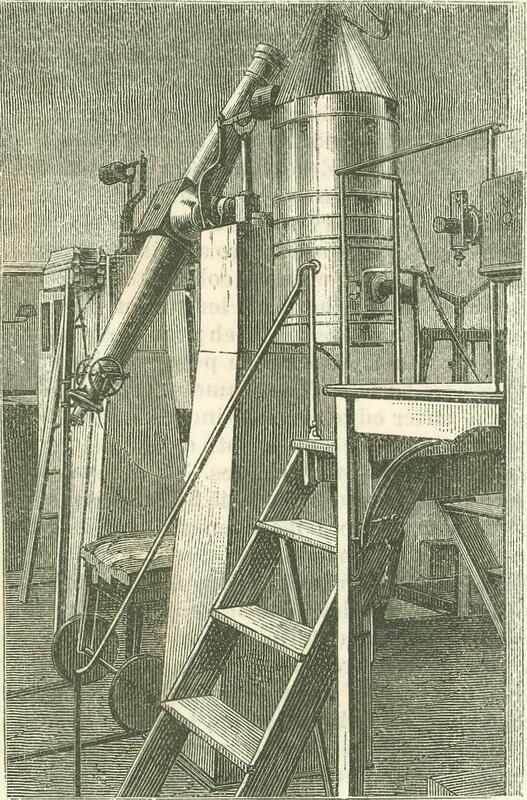 Although the chief design of the observa­tory has been from the first to secure such proficiency in the cadets as would prove of most value to them in the field work to which so many army officers are called, and although neither the professors nor their as­sistants, who are daily instructors in several other branches, can find time available for lengthened series of observations, still at different times valuable observations have been secured in the midst of pressing duties. Among these are those of Professor Bartlett on the great comet of 1843, published in the transactions of the American Philosophical Society, and recent observations under Pro­fessor Michie and his assistants, Lieutenant Bass and others, for determining the longi­tude of the observatory. On five nights during September and Oc­tober of 1873 exchanges of clock signals with careful observations were made be­tween observers at West Point and the ob­servatory of Harvard College. The observ­ers then met at Cambridge to determine the difference in their personal equations. They anticipate from the careful reduction of these observations which is now in hand a very accurate determination of their longi­tude. We regret to learn a new and serious dif­ficulty in the way of the observatory and of the worthy professor who, in 1871, relieved Professor Bartlett as chief of the depart­ment. The West Shore Railroad Company having obtained from Congress the right of way across the West Point property, are running a tunnel which will strike directly under the mural circle tower. If this necessitates the removal of the observatory, we trust that Congress will promptly enable the director to locate it in a position free from all disturbing influences, and with an outfit of the best instruments of every form ; and that a personnel may be detailed from year to year sufficient in number to accom­plish what the head of the department de­sires to attain in astronomical pursuits. We cannot complete this sketch of our government observatories without a just, though necessarily very brief, notice of the observatory used in the instruction of mid­shipmen at Annapolis. Our picture gives a correct view of the building, having near it the monument erected to the memory of several passed midshipmen who were lost in the ill-fated brig Somers. The Department of Astronomy was cre­ated in 1853, and until 1865 was in charge successively of Professors Chauvenet and Coffin. Since that time a graduate of the academy has from time to time been in charge. The course in astronomy is of ne­cessity limited, most of the midshipman's time in this department being required for the study of practical navigation. We learn from the report of Lieutenant-Commander R. L. Phythian to Admiral Porter in 1869 the following facts: "The instruments used in this department are the chronometer, the sextant, the artificial horizon, the azimuth compass, the surveyor's chain and compass, the theodolite, and the plane-table. The observatory is supplied with a sidereal clock, an equatorially mounted telescope, and a superior meridian circle. These instruments are used in instruction only to show the midshipmen the principles of them. There is not sufficient time for them to acquire a practical knowledge of their use by observ­ing with them." 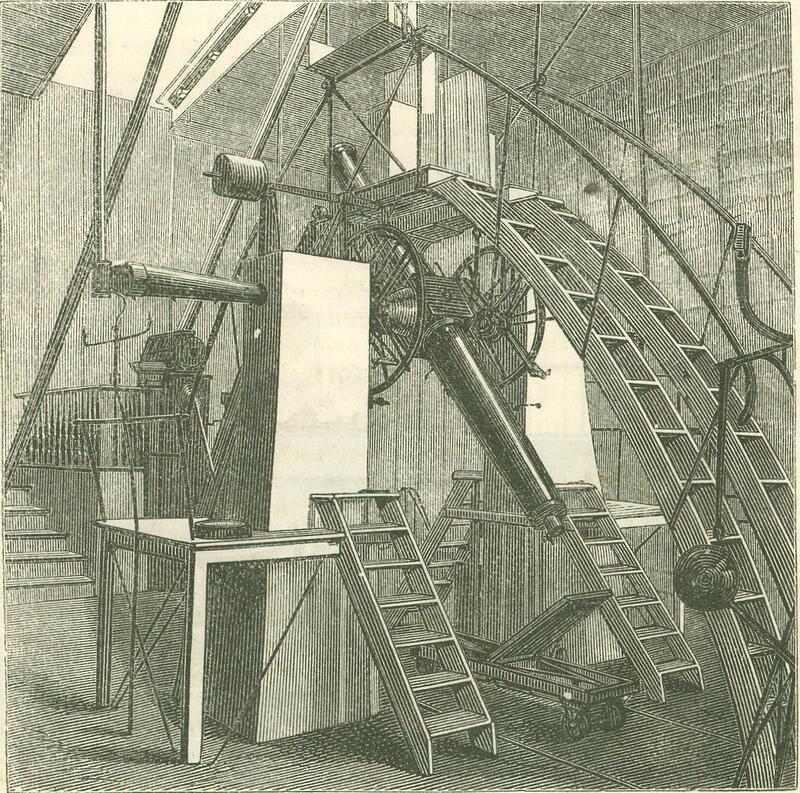 The equatorial referred to by Lieutenant-Commander Phythian is a refractor con­structed in 1857 by Alvan Clark. It has an object-glass of 7.75 inches clear aperture, and nine feet six inches focal length. The tube is mounted equatorially in the German style on a solid cast iron pier, provided with a spring governor driving clock. The finder is a small telescope with an object-glass of 1.7 inches clear aperture, and 20.25 inches focal length. This instrument, loaned by Admiral Porter to one of the parties which observed the solar eclipse of 1869, under Professor Harkness, U.S.N., and Dr. Curtis, U.S.A., is reported by them as having been of most valuable service in the expedition. The meridian circle in this little observa­tory has also a high reputation. 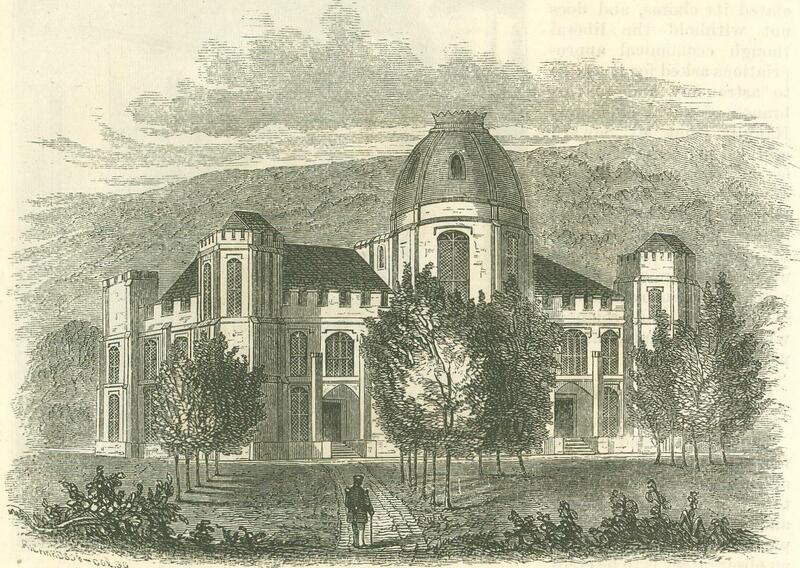 It is not unlikely that in proportion as the course of study at the Naval Academy advances, by the means now used in requir­ing a better preparation on the part of stu­dents before entering the institution, there will be ampler time and a more hearty dis­position for the use of these fine instru­ments, though here, as at West Point, the as­tronomical work must remain mostly educa­tional. At the great institution at Pulkova a number of army and navy officers reside to perfect themselves for geodetic and astro­nomical work to be carried on through the empire. Will it be thus in the United States?